What a great game!! If it's not your team, all you can ask for is a competitive game, and this one didn't disappoint. Both Santonio Holmes and Larry Fitzgerald really lived up to their hype. 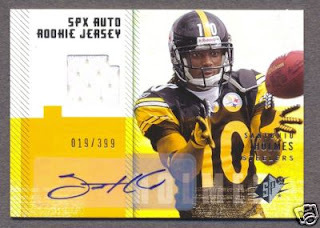 Here is a look at one of their key RC's, Upper Deck SPX. If the Cardinals defense holds the Steelers to a field goal on that last drive, chances are it would be Fitzgerald as MVP. As a long-term investment, who would you want?